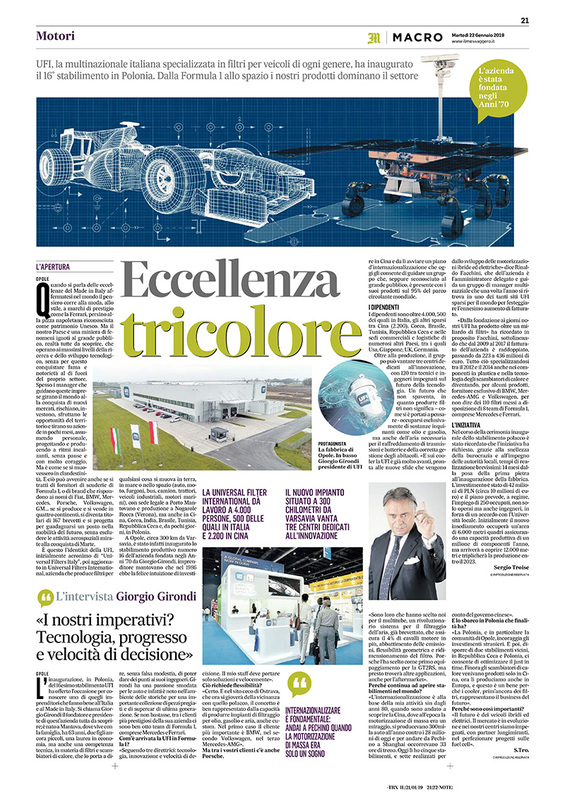 Published by Il Messaggero, by Sergio Troise, 22nd January 2019. 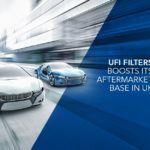 UFI, the Italian multinational that specialises in filters for all types of vehicle, inaugurated their 16th plant in Poland. From Formula 1 to aerospace, their products dominate the sector. When we talk about Made in Italy excellence around the world, we immediately think of fashion, style, prestigious brands like Ferrari, or maybe Neapolitan pizza recognised by Unesco heritage. But our country has a mine of wonders unknown to the general public, waiting to be discovered, that operate at the highest level of research and technological development, that have not gained fame or notoriety outside of their own sectors. Often the managers that drive these companies travel the world to conquer new markets, risking, investing, exploiting local opportunities and setting up companies in just a few months, hiring staff, planning and producing at a fast phase, without taking breaks and with a lot of courage. It’s like they are moving in secret. This can happen, even when they are suppliers to Formula 1 teams, or well-known brands like Fiat, BMW, Mercedes, Porsche, Volkswagen, GM… if your products are produced and sold in four continents, you can become holders of 167 patents and earn a place in the future of mobility, not to mention aerospace markets aimed at conquering Mars. 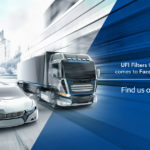 This is the identikit of UFI, initially known as “Universal Filter of Italy”, then updated to Universal Filter International, a company that produces filters for everything that moves on earth, sea and space (cars, motorbikes, vans, buses, lorries, tractors, industrial vehicles, ship engines). Headquartered in Porto Mantovano they have production sites in Nogarole Rocca (Verona), and also in China, Korea, India, Brazil, Tunisia, the Czech Republic, and within days, in Poland. The 16th production plant of the company has been inaugurated in Opole, about 300km from Warsaw. 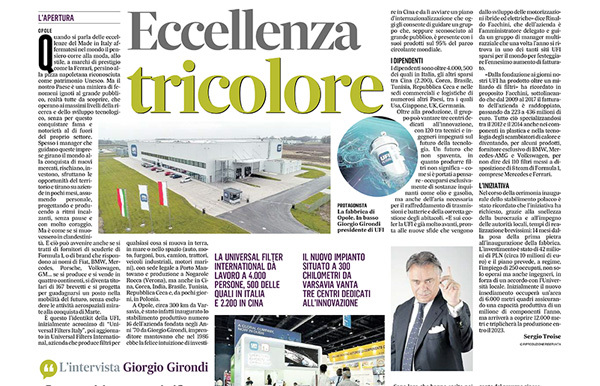 The company, founded in the ‘70s by Giorgio Girondi, an entrepreneur from Mantova, who had the foresight of investing in China in 1986 and from there launched an international plan that today allows him to lead a group that, although unknown to the general public, is present with its products in 95% of the world’s vehicles. There are over 4000 employees, 500 of which are in Italy and the others spread throughout China (2200), Korea, Brazil, Tunisia, the Czech Republic and in their commercial and logistics hubs in many other countries, including the USA, Japan, the UK and Germany. Other than production, the group has three dedicated innovation centres, with 120 technicians and engineers developing future technology. 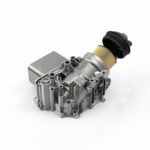 It’s not a frightening future, because producing filters doesn’t mean – as we are led to think – dealing exclusively with pollutants such as oil and diesel, but also air filters necessary for cooling transmissions and batteries and the proper management of cockpits. “UFI is already streets ahead when it comes to coolers, ready for the new challenges that come with the development of hybrid and electric engines” said Rinaldo Facchini, the company’s CEO, who drives a group of multiracial managers and, once a year, finds himself in one of the many UFI sites around the world to celebrate yet another increase in turnover. “From its foundation to the present day, UFI has produced over a billion filters” Facchini recalled, underlining that the company’s turnover doubled between 2009 to 2017, increasing from 223 to 436 million Euros. From 2012 and 2014 they also specialised in plastic components and heat exchange technology and became, for some products, exclusive suppliers for BMW, Mercedes-AMG and Volkswagen, not to mention the 110 filters made for eight Formula 1 teams including Mercedes and Ferrari. During the Polish plant’s inauguration, there was a mention of the initiative that was required, thanks to the low levels of bureaucracy, the commitment of the authorities and very short implementation times: 14 months from the laying of the first stone until the plant was inaugurated. The investment was 42 million Polish Zloty (about 10 million Euros) and the plan foresees the employment of 250 staff at full capacity, not just workers but also engineers, due to an agreement with the local University. Initially, the new plant will cover an area of 6000 square metres, enabling a production capacity of one million components a year, but this will increase to 12,000 metres and tripled production by 2023. The inauguration of the 16th UFI plant, in Poland, gave us the opportunity to get to know one of the entrepreneurs who reflects well on Italy and the Made in Italy brand. He is called Giorgio Girondi, the founder and president of this little-known company; born in Mantova, where he lives with his family, he is 63, has two young children, an economics degree and also technical competence in the field of filters and heat exchangers for cars, which leads him to say, with no false modesty, that he is able to give advice to his engineers. Girondi has a great passion for cars and is, in fact, known in the sector for his important collection of classic and latest generation supercars. If that’s not enough, amongst his most prestigious clients are eight Formula 1 teams, including Mercedes and Ferrari. How did UFI get into Formula 1? “Following three principals: technology, innovation and quick decision making. My staff must find solutions quickly”. “Of course. In our Czech site in Ostrava, which now benefits from its proximity to the Polish site, this concept is demonstrated by our ability to produce filtration systems for oil, diesel and air – even custom ones. Our most important customer is BMW, the second is Volkswagen and the third is Mercedes-AMG”. But Porsche is also one of your clients. 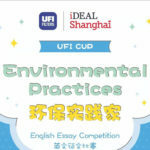 “They chose our multitube, a revolutionary, patented system for air filtration, which guarantees a 4% increase in horse power, lowered emissions, geometric flexibility and resizing of the filter. Porsche chose it as standard equipment for the GT2RS, but soon it will have other applications, even for the aftermarket”. Why do you continue to open plants around the world? “Being international has been at the core of my activity since the ‘80s, when I went to discover China, where at the time mass motoring was just a mirage, they produced 300 cars a year compared to 28 million today and to go from Beijing to Shanghai took 33 hours by train. Today I have five plants there, and seven made on behalf of the Chinese government”. What purpose does setting up in Poland have? “Poland, in particular the community of Opole, encourages foreign investment. We also have two plants nearby, in the Czech Republic and Poland, which allows us to optimise “just in time” production. Until now, the heat exchangers were only produced in China, now we can also produce them in Europe and this is an advantage because coolers, to a greater extent than filters, represent the business of the future”. 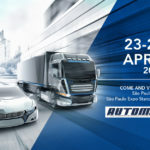 “The future is in hybrid and electric vehicles. The market is evolving and in our centres, we are committed, together with forward thinking partners, to perfect fuel cell projects-”. 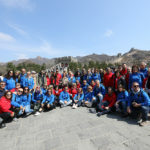 Shanghai – Beijing 2019, the incentive trip for Italia UFI Filters and SOFIMA Filter Distributors.